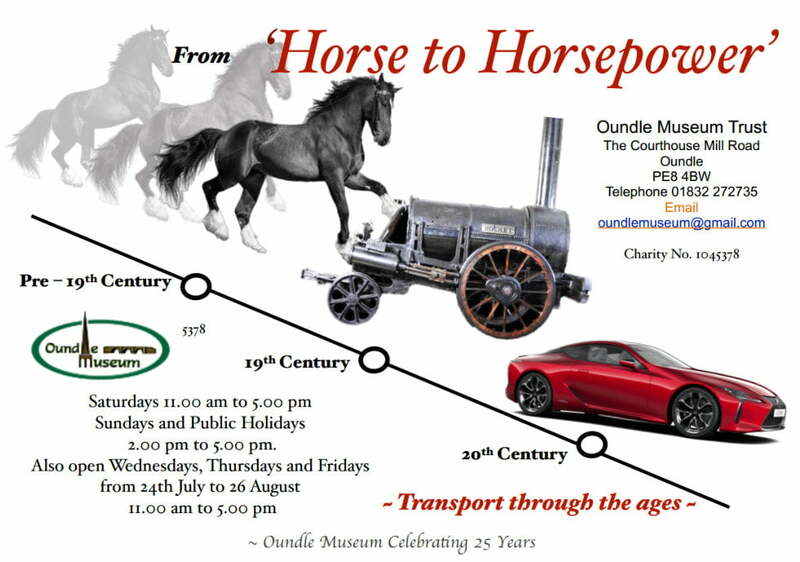 Our Exhibition from Horse to Horsepower includes; the transition from working with horse to steam power and the combustion engine over the last 200 years and the changes that these made within the local community. With special focus on historical changes to transport, for example exhibits on Arthur Howitt’s leather supplies shop, Donegani’s garage, the introduction of the train to Oundle, the development of the north bridge and by pass plus many more model vehicles old and new to see. Do you know your cars? Then why not try the motor car quiz? For children; enter our ‘Museum railway waiting room’ and be the steam train ticket officer handing out tickets to the daily travellers. 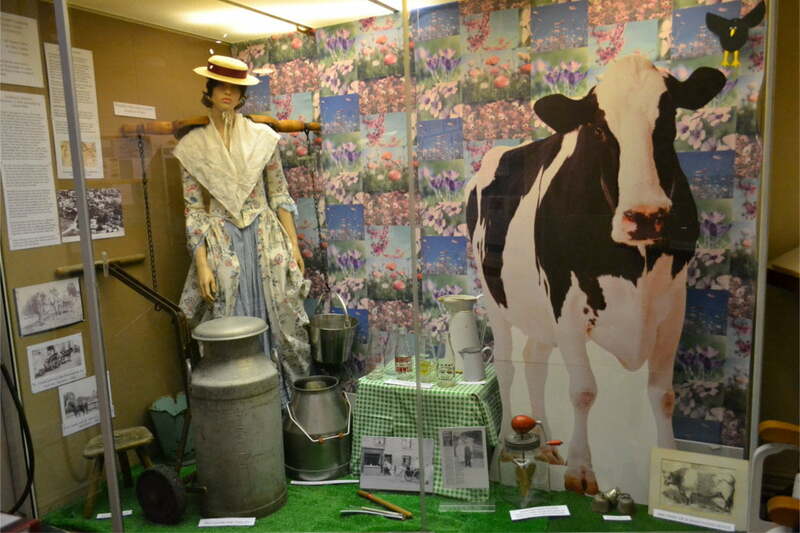 The 2018 theme provides a fascinating look at the agricultural activities based in and around Oundle through the ages. The 2017 theme provides a snapshot of life in the town during the 1940’s. We have a ‘Home Guard’ as security, along with a policeman as well as fashions of the decade, gas masks , examples of rations and a superb ‘air raid shelter’. 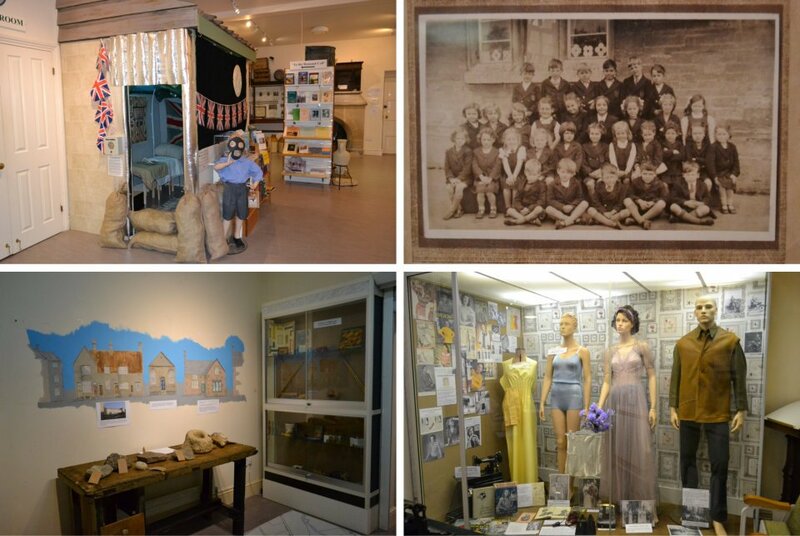 This year our exhibition is all taken from our store room in the Museum. Almost all of the items in the new exhibition have never been on display before. 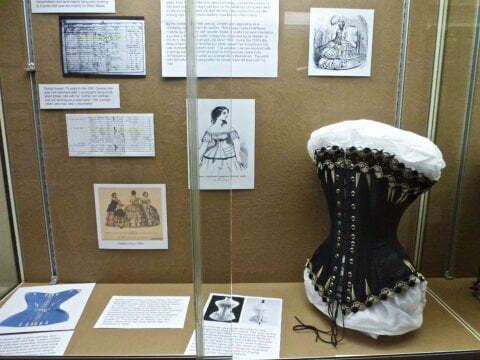 Our Oundle 1851 themed Exhibition contains details of the “Great Exhibition at Crystal Palace”. Learn how the UK led the world in invention. 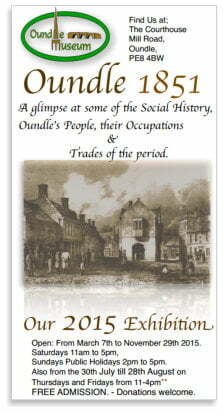 This year’s museum exhibition also offers a glimpse into some of the social history, Oundle’s people, their occupations and trades of the period. There is a rich display of local trades linked to a map of the town with several covered such as: Chimney Sweeps, their history & pitfalls. 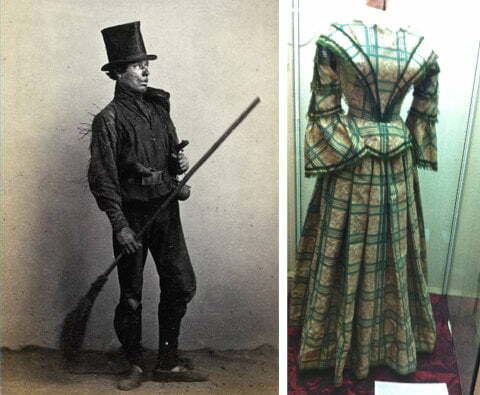 Clothing of the period with examples of local craftsmen’s work and artistry. Whitesmiths of the time, see what they made and how? Clock & Watch making with a display of the intricacies and skills of their industry. The Oundle Brickyard Industry, its owners and development. You can also learn about ‘Unusual Trades’ that have been lost to new inventions. For example do you know what a Fellmonger was, or a Pugger? Also find out about interesting facts about the Oundle Workhouse in 1851. On display is a history of the Oundle Workhouses, where they were, the inmates, their names and occupations. 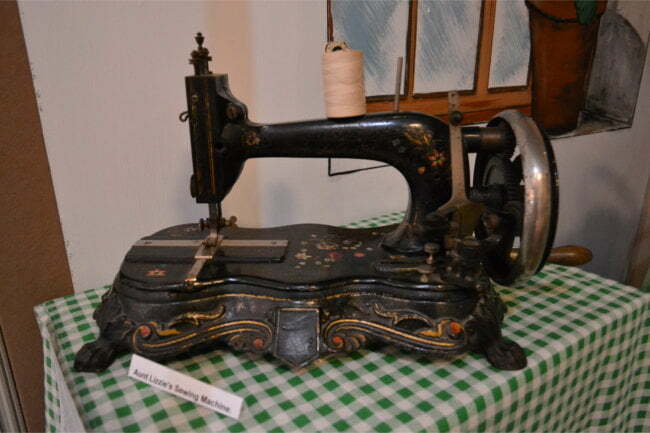 In the ‘Children’s Corner’ visitors can discover games of the Victorian Period. 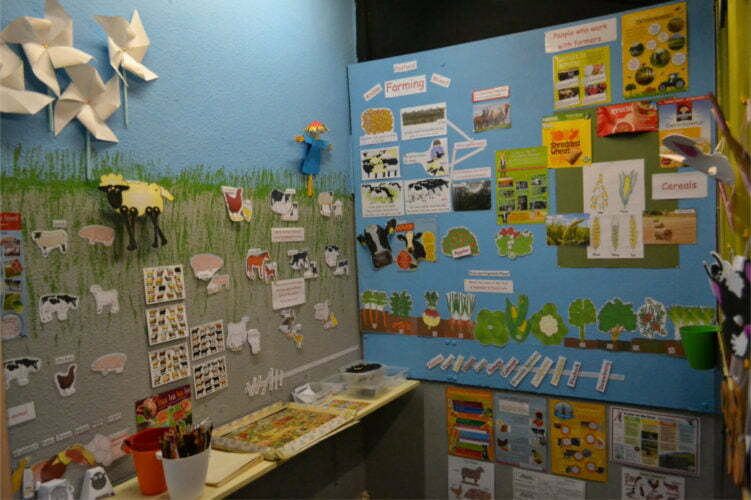 We also have some interesting displays on places of learning in the period. Of course the kids (and adults) will want to make sure they visit “The Prisoner” in our cells. Travel a section of the “LNWR” railway via a computer generated 3D view. Travel back in time and imagine steaming along the line from Tansor to Barnwell, passing through Oundle on the way. View an excerpt of the Tansor to Barnwell Steam railway video that is on view in the Museum, click below.